Some work we have done at TransportLab at the University of Sydney. 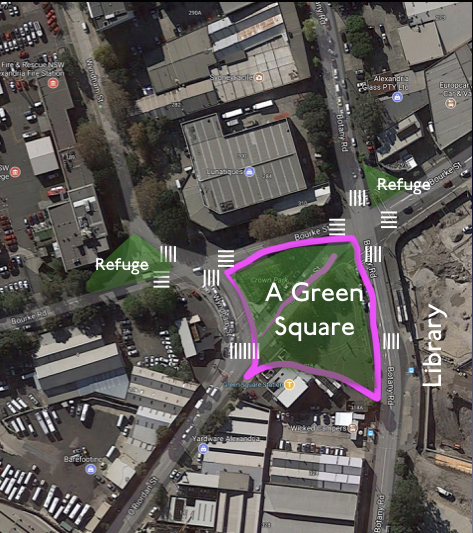 I wrote The Alexandria – Moore Park Disconnector for WalkSydney about a road widening project in my neighbourhood. Read the whole thing, and if you are a New South Welshman, feel free to get in touch to help WalkSydney.org make Sydney a better place. Polycentricity is most commonly measured by location-based metrics (e.g. employment density or total number of workers, above a threshold, used to count the number of centres). While these metrics are good indicators of location ‘centricity’, the results are sensitive to threshold-choice. We consider here the alternate idea that a centre’s status depends on which other locations it is con- nected to in terms of trip inflows and outflows: this is inherently a network rather than a location idea. A set of flow and network-based centricity metrics for measuring metropolitan area poly- centricity using Journey-To-Work (JTW) data are presented: (a) trip-based, (b) density-based, and, (c) accessibility-based. Using these measures, polycentricity is computed and rank-centricity distributions are plotted to test whether these distributions follow Zipf-like or Chirstaller-like distributions. Further, a percolation theory framework is proposed for the full origin-destination (OD) matrix, where trip flows are used as a thresholding parameter to count the number of sub-centres. It is found that trip flows prove to be an effective measure to count and hierarchically organise metropolitan area sub-centres, and provide one way of dealing with the arbitrariness of defining a threshold on numbers of employed persons, employment density, or centricities to count sub-centres. These measures demonstrated on data from the Greater Sydney region show that the trip flow-based threshold and network centricities help to characterize polycentricity more robustly than the traditional number or density-based thresholds alone and provide unexpected insights into the connections between land use, transport, and urban structure. In this country of 25 million people, there are many sport leagues and franchises, maybe more per capita than minor league sports in the US, and thus more similar to college or even high school sports. AFL is popular in Melbourne and the western parts of Australia, NRL in New South Wales and Queensland. The maps of professional teams are shown below, and are visible examples of the process of spatial diffusion of competing ideas (in this case, competing footy codes). The rules are too complex to explain here, but feel confident that they have a family resemblance to American-rules football, but all have evolved from the proto-ball sport in different directions. AFL is more soccer like (but players can touch the ball and punch it, but kicking remains important, serving the role of the forward pass and punt) and played on a cricket oval. In contrast NRL is more like American football without a forward pass, and played on a rectangle. NRL has downs, but no such things a first down, the team scores or turns over the ball. AFL players are leaner and taller, NRL players are stockier. Neither use helmets. AFL is probably safer. I believe the expression is: the NRL is a ruffian’s game played by gentlemen, the AFL is a gentlemen’s game played by ruffians. *[update in the footnote] The balls themselves are similar. In the NRL, the most important event during the season is the State of Origin series, which is an all-star like event where the best players from Queensland play against the best players from New South Wales. This is a 3-game series. AFL once had a similar event. The AFL Championship (broadcast on the Seven network) this year is the Collingwood Magpies vs. the West Coast Eagles, played at the southern hemisphere’s largest stadium, the Melbourne Cricket Ground (MCG), where the championship has been played almost every year since 1902. Where the hell is Collingwood? It’s a neighbourhood of Melbourne. Where is the West Coast? Somewhere on the Indian Ocean I suppose. Why does a Melbourne neighborhood get a team in the national championship, while an entire coast of the only known inhabited planet’s third largest ocean get another? Something looks gerrymandered. The AFL used to be (in living memory) the Victoria Football League (VFL) and it grew out of club sport serving highly localized fanbases, much like Baseball (the Brooklyn Dodgers), Basketball (the Fort Wayne Pistons), and Football (the Camden Bulldogs) in the US. The NFL still has a team in Green Bay, recalling its roots. The whole system is more reminiscent of Premier League with its many teams in London. Collingwood’s uniform resembles that of a US referee, or prisoners in old-timey striped outfits. Much worse than the Yankees pinstripes. The Eagles are much more modern, with the distraction of a Hungry Jack logo in the corner. * In the event the Eagles won this year 79 – 74 in an exciting match that saw them come-from-behind in the last few minutes. The key thing about Australians is that they love the idea of being in love with sport more than they actually love sport. This is not to say there are not Australian sport fans, there obviously are, and ABC Radio reports more on sport than America’s NPR, but the reality of sport fandom is not so different than/from/to the US. Sport faces the same pressures as in the US, the coverage, the TV shows about the wives of ballers, the advertising, the concern about the player whose sister who loved playing herself died tragically two weeks earlier, it’s the same but relabeled. I have heard some promote the terrible idea that Australian unis should have college sport the way US schools do to promote something (school loyalty, alumni donations, more corruption). While US college sports does promote those things (relative to Australia’s relative indifference), it’s an historical anachronism due to their arrival before professional sport. Australia is nothing if not oversaturated in sport. So even if such clubs could be established, I am not clear they would get anything resembling American college fanbases. However today, sport at the uni level is basically at the intramural level, and on the level of Middle School sport in the US. So these championship games don’t necessarily sell out the arena in which they are paid. Regular season games seldom sell out. Part of this is hurt by teams playing in large metropolitan stadia. NRL teams in Sydney often play in Sydney’s large Olympic Stadium named after a financial company with the letters A and N and Z in its name, or a different stadium in Moore Park named after a different financial company with A and N and Z in its name. Nevertheless there are plans to remodel the first and replace the second stadium. This is of course unnecessary. These final games are nevertheless Superbowl-like spectacles; the Black Eyed Peas (sans Fergie) were one of the opening acts for the AFL game, they have previously done a SuperBowl (in 2011). The NRL Premiership (on the Nine Network’s Wide World of Sports) is the following day (Sunday). There is also a women’s game, and a junior game, earlier in the day, but the stands are mostly empty for these matches. In 2018 it’s the long awaited match between The Sydney Roosters vs. The Melbourne Storm. As you can tell, the Roosters, by their nickname, are an old club, and the Storm are much newer, when abstract nicknames gained popularity. The Storm are appearing in their third consecutive Grand Final. The pre-game show has much guitar and fireworks and smoke, but its mostly cleared by game time. The athletes are standing for Advance Australia Fair, but of course Australian police officers don’t kill nearly as many Australians as US officers. Sport is probably the most racially integrated sector of Australia, now struggling with appropriate recognition of First Australians, well behind Canada and New Zealand in this regard, but arguably ahead of the US at this point. The Roosters are sponsored by Steggles — which due to the cursive font at first I thought was Steagles, like the World War II mashup of the NFL’s Philadelphia Eagles and Pittsburgh Steelers. Steggles sells frozen chicken. So it’s a bit auto-phagic or cannibalistic to be sponsored by a company that will eat you and your kind. The Storm are sponsored by Crown Casino. The Refs are sponsored by Youi, which is an insurance company. Most NRL teams were historically in greater Sydney, and the Roosters were based in the wealthy Eastern Suburbs (think Bondi), but the league has expanded to have teams in other Oceania cities (including one in New Zealand and 3 in Queensland (costing Sydney some franchises, but in this 16 team league there remain 9 Sydney area teams. A quick guide for Americans. NRL is basically like American-rules football except: Scoring in NRL: Field Goal = drop goal = 1 point, a touchdown = a try = 4 points. The extra point conversion kick is worth 2 points, and is kicked from the edge of the field, and there are no blockers. This is also a 2 point penalty kick. When you score the other team kicks off to you. There is one set of 5 downs. There are a lot of punts on the 5th down, though teams seem more likely to go for it, and turn the ball over if they don’t score a try, sometimes they just go for a 2 point kick (but there are no special teams for this, this is in continuous play, unlike the 2 point conversion and penalty kicks). Punts are a combination of punt and forward pass (in that a team can recover its own punt, but there is no actual forward pass, all passes are lateral and backwards (like the end-of-game play the American-rules football team behind sometimes does). The offensive and defensive players are the same. There is no quarterback or other specialist players, though some players are of course more significant than others. There are no helmets, but there are similar concussion issues. There are no huddles or timeouts (except official timeouts and instant replay reviews). There are nevertheless fumbles and interceptions and other kinds of turnovers. It’s a continuous flow game, and lasts 80 minutes of actual activity. The players wear shorts and short sleeve shirts. There are scrums when control of the ball is disputed somehow. The penalty box is called the Sin Bin. In short, it’s a superior game that could become popular in the US, except for the lack of the forward pass, but I don’t know how it could be elegantly incorporated. In the event the Sydney Roosters defeated the Melbourne Storm 21-6, a game the Roosters dominated from the beginning. After this weekend’s sportgasm, Monday is a holiday, Labour Day in NSW, ACT (Canberra), and South Australia, but Queens Birthday in Queensland*, and the beginning of the two week Spring Break for schools in NSW. Holidays are not standardised across Australia, the states are much more nation-like. This survey would be incomplete without mentioning that there is also Cricket (in a few distinct formats as people are less keen on 5 day matches than they once were), basketball (the NBL), netball, A-League soccer (which is growing, but not yet dominant), and the ponies. While it is “Sport” not “Sports”, note that it is “Maths”, not “Math”. Why? Because. In addition to Sport and PE, public primary schools also have two lunch/recess periods, and an opt-out religion indoctrination course, so the curriculum is perhaps not as academically rigorous as it might be. Rugby League is not to be confused with Rugby Union. I have been informed by an Australian that “In fact it applies to the difference between Rugby Union and Rugby League, the latter being a break way from Rugby Union which occurred in the north of England in 1895. The differentiation was that Rugby teams in the north comprised more working class men – coalminers etc – whereas in the south it was played by amateurs who had probably gone to one of the rugby football playing Public (read private) Schools. That tradition continues in Sydney with the so called Great Public Schools being strictly rugby union playing and historically Rugby league being played more by, for example the poorer Catholic schools. Certainly League is still more associated with the so called working classes if there is such a class any more.In fact the first rugby union club to be established in Australia was Sydney University’s in 1864 and the first match was in 1869 against my other alma mater Newington College. So in fact it is Rugby Union that is the ruffians game played by gentlemen – and that fact was certainly undeniable – and Rugby league is, well, a ruffian’s game played by, well, ruffians! It was Football or Soccer that was termed a Gentleman’s Game played by ruffians (or thugs). Hungry Jacks is Australia’s Burger King, though it tastes slightly better for some reason. In general Australian burgers are adulterated with items that are not ground beef, but the chains (like Macca’s and HJ) seems to avoid that problem. It is also also worth noting that a ‘burger’ is any kind of sandwich with cooked meat (so chickenburgers (chicken fillets) and lambburgers are common. The Queen’s Birthday Holiday is not actually the Queen’s Birthday, and is celebrated on different days in different states. I should also note somewhere that the Herald Sun (in Melbourne, owned by Newscorp) where the Grand Final of the AFL is front page news, is not the same as the Sun Herald (in Sydney, owned by Fairfax) where the NRL Premiership garners headlines, if things weren’t confusing enough.